Here’s your final video, which shows the final steps to quickly assemble a shed. This video runs for less than 5 minutes, so don’t wait any longer. Start with the back wall and one of the side walls. Align the panel's up with the pre-drilled holes. Side wall panel channels, fit into the notched front and rear wall panel channels. Once aligned, connect the panels. Take care to ensure that both front and rear wall panels, are not positioned upside down. The top channel of each panel is pre punched for attaching to roof sheets or Gables' section. The bottom channels are not pre-punched. Continue to join the remaining panels together. 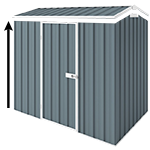 Now that you have connected all the wall panels and if you are assembling a product from the classic or region range of sheds, attach the rear gable sections to the rear wall. And the front gable section to the front wall of your shed. So there you are, the final steps to assembling a shed!